All right. You got me. I'm not Nick. I'm not Lucifer. I'm you. Yeah. I'm your, you know, subconscious or whatever. Y-You whipped me up to help you figure this out. "Jackifer" is a subconscious manifestation of Jack Kline's, which takes the form of his father, Lucifer. After teleporting around the world, Jack returns to the cabin where he accidentally killed Mary. 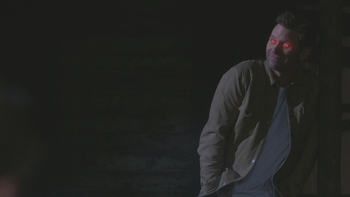 He is surprised by the appearance of Nick / Lucifer, who reveals that he is neither, but in actuality Jack himself, specifically his subconscious, and was "whipped up" to help Jack with his problem. Jack, however, refuses his help. His subconscious continues to offer him advice, telling Jack there is no way out of the fact that he killed Mary Winchester and that the sooner he accepts what he did, the easier things will be. Jack's mind manifests Lucifer once again as Rowena is preparing the ingredients for the spell to bring Mary back. He tells Jack he doesn't feel anything anymore and that the sooner he is able to admit that to himself, the sooner the "phantom pain" can go away. When Jack tells him to shut up, Lucifer continues to tell Jack that the spell won't work and he knows it. After the spell fails to bring Mary back, Lucifer appears and tells Jack that Dean, Sam, and Castiel will never trust him again, and that now, he can never trust them. Jackifer is similar to Hallucifer from Season 7. This page was last edited on 23 April 2019, at 02:11.